Concerts and other events are held in St George's Church from time to time. Entrance is free. Donations towards the Church Restoration Fund are welcome, suggested amount €5. "Cantando", a wonderful choir from South Africa, performing in front of the recenty restored altarpiece. 25th May 2015, Sussex Festival Choir, director Stephen Hope. Music by Ledger, Purcell and Rutter; extracts from Handel's Messiah. 16th May 2015, Vox Amicorum. Music by Vivaldi, Pergolesi and Puccini. Conductor Marc van den Borre. 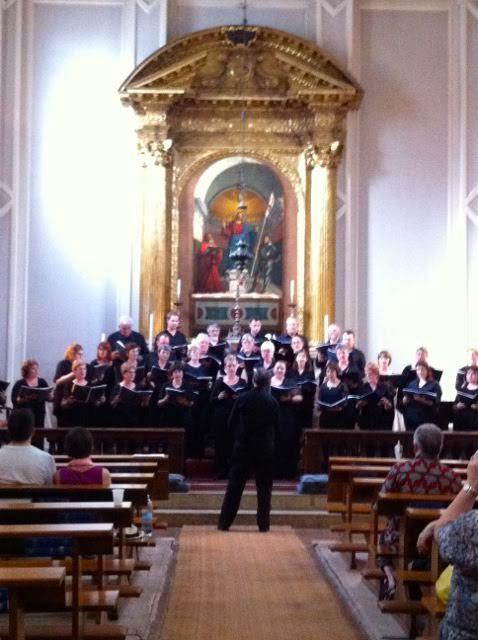 8th May 2015, Singing in Venice, conducted by Chris Watson (Tallis Scholars, Gallicantus and Collegium Vocal Ghent. Music by Sheppard, Taverner, White and Bednall. 16th July 2014, Bede Academy of Blythe, Northumberland. 5th June 2014, Ancor Chamber Choir of Limerick, Ireland. Music by Byrd, Palestrina, The Beatles and traditional Irish music. 10th May 2014, Vox Amicorum of Antwerp, conducted by Peter Asprey. Music by Vittoria, Tallis, Desprez, Byrd, Purcell and Rossini. 22th July 2013, Warwickshire Youth Waits, UK : "An Englishman in Venice" - Music for wind and string instruments by Gabrieli, Byrd, Monteverdi and Dowland. 16th July 2013, St Philomena's School Chapel Choir, Carshalton UK. Music by Faure, Franck, Pachebel, Rutter, Vivaldi and others. 25th June 2013, Royal St George's College Chapel Choir, Toronto, Canada. 21st April 2013 Music at the time of Shakespeare. Eugenia Corriera (soprano), Laura Secco (viola da gamba and flute) and Pier Paolo Ciurlia (lute), music by Dowland, Johnson and others. 18th April 2013 Orchestra of the Roger Ludlowe Midddle School, Fairfield, CT USA. Conductor Mr Gjorgj Kroqi. 13 October 2012 Concert "The International Choir of Singing in Venice" director Eamonn Dougan, music by Gabrieli, di Lasso and Byrd. 9 June 2012 - Ensemble Ottavino Petrucci Venezia "aperitivo" concert of early music. 28 April 2012 - Naples American High School concert of sacred and secular music including spirituals, folk songs and renaissance music. 21 April 2012 - I Fiori di Venezia, a concert of sacred and secular music by Ars et Amici, Director Sheila Beardslee, Boston, Mass. USA. Music by Monteverdi, Gabrieli, Canale, Marenzio and others. 10 April 2012 - Platinum Boys Choir, London, Director Scott Inglis-Kidger. Music by Parry, Wesley, Elgar, Holst, Monk, Bates and Mozart. 4 April 2012 - The Venetia Antiqua Ensemble: Liesl Odenweller, Soprano; Johanna von der Decken, Soprano; Luca Mares, Violin; Michele Favaro, Traversiere; Nicola Favaro, Oboe; Serena Mancuso, Violoncello and Marija Jovanovic, Harpsichord. Music by Handel, Fasch, and Couperin Leçons de Ténèbres.